First up is the men’s vest. There are really so few men’s patterns out there it’s refreshing to see something simple and trendy. Why there are so few men’s patterns I don’t really know but they can be scarce. This is especially frustrating since I find women usually want to knit their hubby something simple that can be worn with multiple other items. This shouldn’t be such a tall order! Digression past, BSA has put out this lovely simple vest pattern which is knit in my fave: Sport or Melange. The colour combos are endless and the yarn is soft and warm, just what I would like in a vest! The next two patterns are great for Spring knitting. 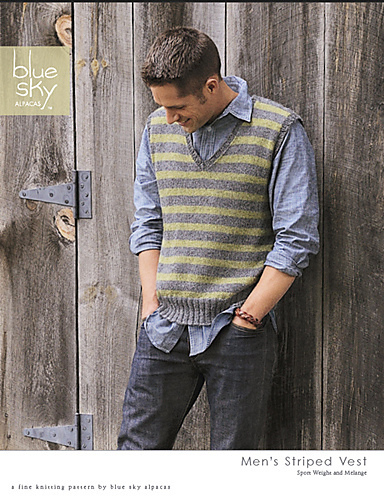 They are knit in the Blue Sky Alpacas Silk, a warm yarn with the beautiful drape of silk. I knit up the Rectangular Shawl in BSA Silk and it’s one of my favorite pieces (even though I knit it in black which left me incredibly bored by the end of it!). The Alpaca Silk has a great shine as well and comes in perfect colours for spring, or some darker hues if they are more to your liking. First up is the Cecily cardigan. A lovely open lacey item for mild spring days. Last is a gorgeous shawl with a leafy patterned edge to it called the Kaw Valley Wrap. I am thinking it will make a really great Mother’s Day gift, or perhaps a beautiful wedding shawl? There are so many uses for a shawl so lovely, as a gift or just for you. This entry was posted on Monday, January 17th, 2011 at 4:12 pm	and is filed under Uncategorized. You can follow any responses to this entry through the RSS 2.0 feed. Both comments and pings are currently closed.